HIGH POINT, NC (October 2011) - Marge Carson's spectacular fabrics this fall are lush and luxe, with sophisticated neutrals shaping the collection. The lineup is right on trend, punctuated with color inspired by top fashion designers. "As always, the core of our collection is a neutral base, making it very livable," says Christine Rendino, who leads the upholstery fashion design team for Marge Carson. "Then we layer colors on top of that. We have more color than ever before, starting with hints of the blue trend. From Gucci and Michael Kors to Balmain and Balenciaga, fall fashion is awash with all shades of blue, which we've translated from the darkest midnight to the palest sky." Hamsa Midnight, for instance, is a midnight blue silk accented with sequins and metallic gold embroidery while Trousseau Couture is on the lighter end of the spectrum. "All of these fabrics easily accent our neutral golds, taupes and ivories," Rendino explains. "From the very traditional medallion pattern of Eventful Teal to modern designs that would make Mondrian proud, the new blue fabrics are the accents that make a home complete - just as a beautiful handbag completes an outfit. These blues are fresh and chic and, at the same time, classic and timeless." Beyond all this attention to blue, Marge Carson is giving a nod to other fashion trends, too. Throughout the showroom, there's evidence of purple as an up-and-coming color and - as found on the most elite runways - pops of bright hues as well as color blocking. 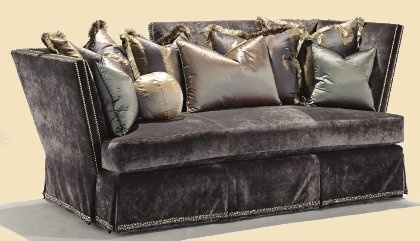 Mixed metallics, a blend of gold and silver, are also in vogue, played out in patterns like Gallant Night, used to accent the new "Alta Loma" sofa. But Marge Carson is much more than a fashion-forward resource; the company is just as well known for high-quality craftsmanship, impeccable attention to detail and the ability to customize each piece to the nth degree. Those qualities are beautifully demonstrated in no less than 10 new upholstery pieces. Among the introductions is "Mimi,"" a nearly 10-foot-long, crescent-shaped sofa that's asymmetric in style. Higher on one end than the other, it's being shown in tone-on-tone ivory fabrics. 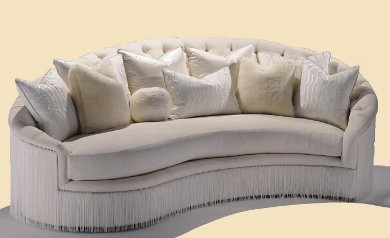 The piece itself is upholstered in Powerful Pearl while pillows are decked out in similar tones, embellished with sequins, embroidery and eco-fur. What makes this a "Wow!" 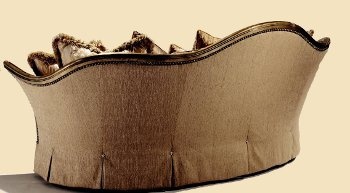 sofa, however, is its silver nailhead trim and boullion fringe that wraps around the back of the piece, falling from the top edge all the way to the floor. "The fringe has a see-through effect that lets you glimpse the entire silhouette, says Rendino. "It is an intriguing effect." Another "Wow!" 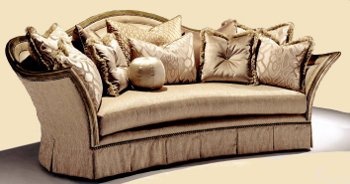 sofa this market is "Luciana," characterized by its dramatic curves.  Not only do the arms and back curve up and down, they curve in and out, as well. What's more, nailheads border the wood trim while Swarovski crystal buttons secure the top of each back pleat. To fully appreciate the beauty of this 112-inch sofa, you have to walk all the way around it, making it the perfect piece to float in a room. Being shown in Transforming Angel, a soft beige fabric with a hint of blush, it's accented with pillows in Jamba Mica - a similarly colored velvet - and a textural embroidered silk called Siam Blush. But the high quality that Marge Carson is known for is nowhere more evident than in the "Seville" sofa. Complementing the company's new case goods collection, this seating piece features the same intricate wood carving and metalwork accents found throughout the group. The sofa is being shown in Mega Mocha, a soft velvet chenille that looks good enough to eat, with pillows in Avenue Taupe, a slightly darker velvet, and Zelda Fleur, a floral pattern embroidered with platinum metallic thread. It's all very appealing, very luxurious - very Marge. Founded in 1947 Marge Carson, Inc. is one of the world's premier manufacturers of high-end residential , furnishings, including upholstery, case goods, occasional pieces and decorative accessories. With more than 55 finishes and 600-plus fabrics, embellishments and leathers to choose from, Marge Carson is known for completely customizable pieces.